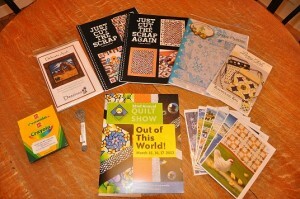 I spent Worldwide Quilting Day in the best way possible – in the company of quilters at a quilt show! My Quilt Guild arranged for a bus to transport 45 quilters for a day at the Quilters Anonymous 32nd Annual Quilt Show in Monroe, Washington. Dee of The Quilted Trillim was in attendance with her realistic raw edge applique designs. Dee told me that with her no tracing applique technique, I should be able to make her Delicate Arch project in a weekend. There are many tiny pieces in this pattern so I don’t think I will be making this one that quickly! 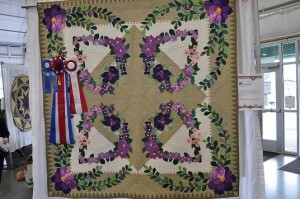 Michele Crawford of Flower Box Quilts was in attendance with her husband. I was really impressed with the simplicity of the two blocks – Block A and Block B – that are behind the design of the quilts in Michele’s two books. Once you make the two blocks the quilt designs are developed by sub-cutting those two blocks. Very clever! 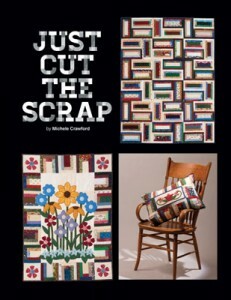 Michele indicated that she is now working on a third book in this series. 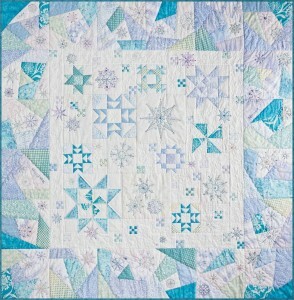 This is a picture of the cover of the pattern: Snow Flurries. This is a new design by Crabapple Hill Studios that I have been looking to make. This is the pattern jacket from the Lazy Girl Designs’ bag pattern, Runaround Bag. Some of the patterns are tinted with Crayola Crayons. It’s a really fun technique that looks SO COOL when it’s done right!!! I like to start the process by coloring any area that’s going to be tinted with white crayon. It sort of “fills” the weave of the fabric and smooths it out to create a base for the colored crayons. It also helps with the blending of colors……….SO!!! You can go through quite a bit of white crayon in a single project. In “Calendula Patterdrip’s Cottage” I used almost 3 white crayons. Having to buy another ENTIRE box of colored crayons just to get one, single, lousy white crayon is just, well……maddening! But….having a little box of all white on hand…..is…..happy-ing! Yes, that’s a new word. 2. Make sure your work surface is clean and smooth and there isn’t any lint/threads on the back of the fabric. 3. Color all areas that you’ll be tinting somewhat heavily with white crayon. 4. Tint all areas as directed in the pattern (or use your own imagination!) I like to use a little circular motion……..
5. Heat set with a hot iron by laying a white paper towel over the tinted area and pressing (you’ll smell the wax) Remove the paper towel and look at it…..if there’s ANY color on it repeat the pressing process with a clean paper towel. In the same demonstration I learned about a metallic look embroidery thread called, Cosmo Sparkle Thread. I learned how adding a bit of sparkle floss to a stitchery project can add just a little special something to your project. The Snow Flurries pattern that I bought uses sparkle floss, and crayons so I will be able to try out the new techniques that I just learned. Lecien has been producing Cosmo embroidery thread in Japan since 1950. Cosmo thread is made from the best grade of Egyptian cotton available and its texture and sheen is equal to that of silk. Cosmo floss doesn’t twist and tangle like other flosses, and is easy to separate the strands for stitchery projects. Cosmo thread glides smoothly through fabric. To use Sparkles – do NOT pull an end like you would with other flosses. Gently remove the paper sleeve. Handle gently and keep the loops in nice circles. Find where the knot is; these 2 ends are the ends of the 10 meter strand. Open the loop twice, until all that is holding the loops together is the knot. Gently pull the 2 ends of the strands till the knot is away from the loops and cut the knot. Carefully wind Sparkles around a spool or bobbin. 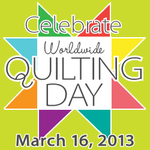 Today was the perfect way to celebrate Worldwide Quilting Day! Dougal Walker was our guest speaker at our January quilt guild meeting. 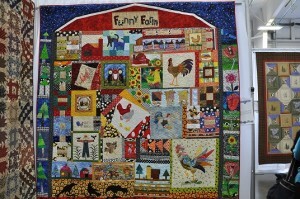 Dougal kept us entertained with her trunk show of all her patterns made into quilts and wonderfully humorous dialogue. The cats that were the inspiration for this piece were Dougal’s own cats. So the dogs were not outdone by the cats, there is a piece dedicated to our 4 pawed friends that bark, not purr. A garden-themed piece that mixes stitchery and applique. Snowmen! I love snowmen and almost brought this pattern home with me. 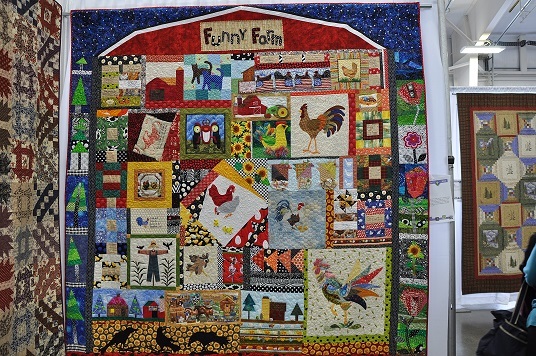 Another snowman quilt – a snowman for each month of the year. 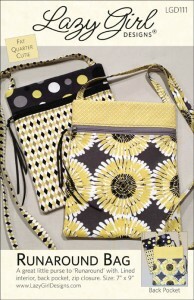 OK, I couldn’t keep resisting, this pattern DID follow me home! 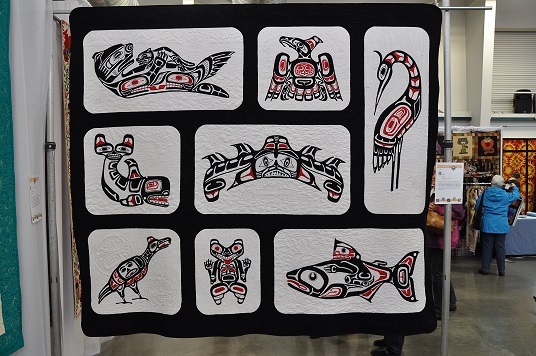 Adorable is the only way to describe this quilt! Notice the lace curtains on the window. The gal from our Monday night quilt group that came along with me to the guild meeting as a guest could not leave this pattern behind. ……………I think she has a soft spot in her heart for snowmen too! I previously purchased this quilting mice pattern and enjoyed seeing it in “real life”. The same quilting mice done in all red thread. It is fun to see the same design done in two different ways. This piece was inspired by what is inside our closets. Angels are always a favorite. 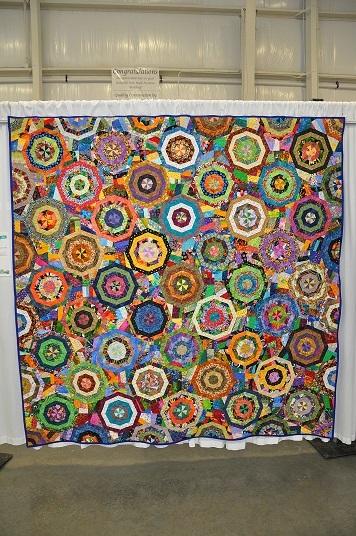 This piece was done in applique with some stitchery accents. This is a perfect quilt for summer – ice cream flavours. Australian animals were the theme of this appliqued piece. 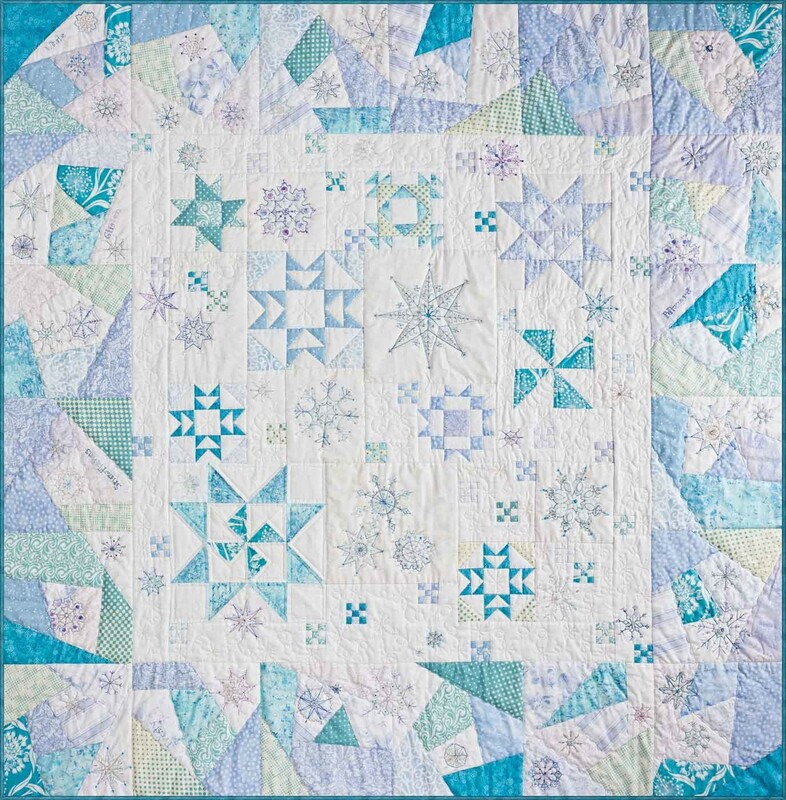 The pattern for this quilt appeared in one of the Australian quilt magazines. A trip to Hawaii inspired this piece. 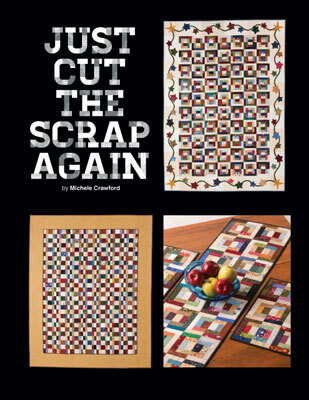 Because Dougal worked on this piece while vacationing in Hawaii, she needed to work on the piece in smaller chunks. 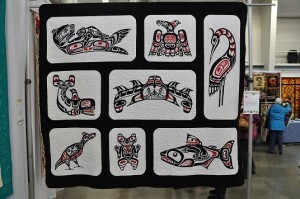 This was constructed via a quilt as you go technique so that each small quilted piece could be worked on as a portable project requiring a small amount of room on the plane while travelling. Once Dougal got home, she assembled the pieces together into one large quilt. you can see the blue leading in the finished quilt that joins the smaller quilted pieces together. This was a guild challenge project. This piece provides incredible insight into Dougal’s imagination! Dougal hoped that her presentation and patterns would serve to inspire our own individual creativity. I know I went home inspired to re-visit my own stitchery projects.